This picture comes from Kelly Pfister of the Blue Stars. 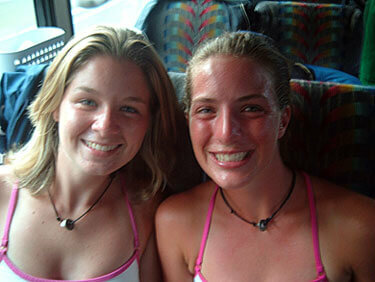 This picture is of me and my seat partner, Laura DeRousselle, during finals week on the drum line bus. Several times during the summer we would unknowingly wear the same or similar outfits to rehearsal. In this picture we were wearing the same tops. Laura and I were both rookies last summer. I was in the pit and Laura was in the baritone line. We didn't know each other at all before tour started, but we became great friends over the course of the summer and discovered that we had a lot more in common than just our wardrobes. Even though I'm in Missouri and she's in Texas, we still keep in touch and plan on sitting together again this summer!